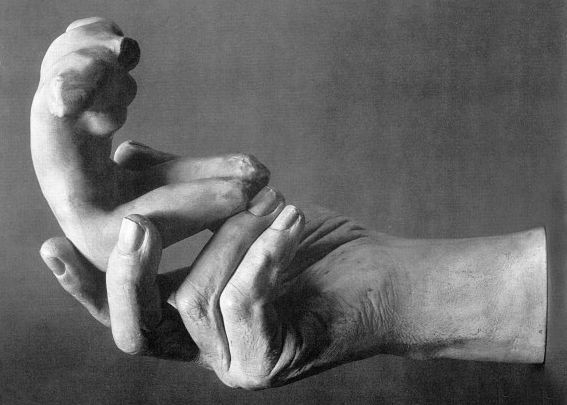 In the late 1880s, Rodin began with several studies of hands. The idea to model hands separated from their bodies was inspired by the photographer Eadweard Muybridge in 1887, who made a series of hands with dramatic gestures, silhouetted against a dark background. 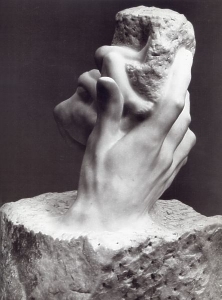 For Rodin, who by this time started to fancy fragmentary sculptures, such isolated hands still had the complete capacity to express emotions. 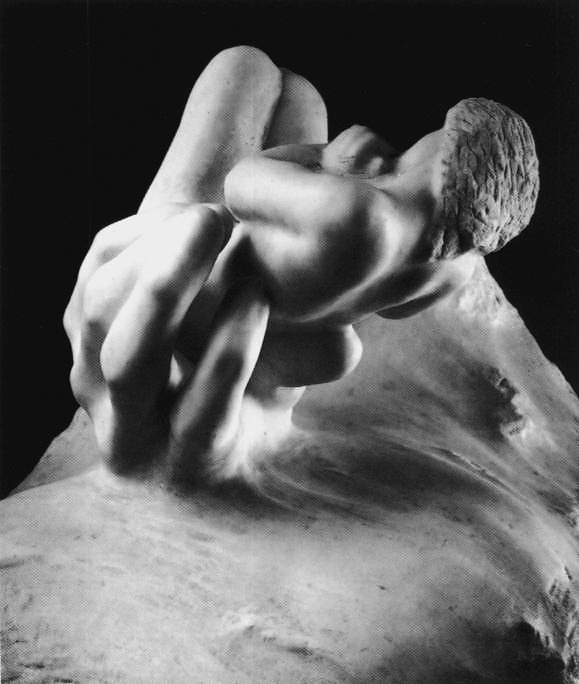 After having executed 'The Clenched Hands' and the 'Left Hand' in 1885 as studies for the 'Burghers of Calais', Rodin modeled 'The Hands of God' in 1898, which became one of his most famous studies of isolated hands, together with 'The Cathedral'. "When God created the world, it is of modeling he must have thought first of all." This statement illustrates that Rodin thought of the Creator as an artist, at the same time attributing quasi god-like qualities to himself as a sculptor. 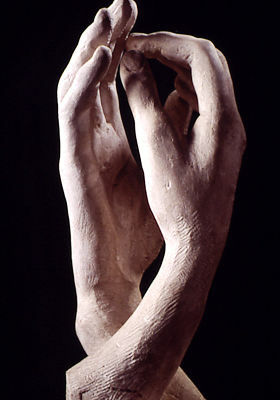 After Rodin's death in 1917, this self-agrandizing tendency was picked up by his admirers, who used a plaster cast taken from Rodin's hand and combined it with a small female torso; this posthumous composition, which closely resembles 'The Hand of God', became known under the title 'Hand of Rodin'. This way not only the association between Rodin and God was cemented: also his assistants, instructed by Leonce Bénédite, now seemed to participate in Rodin's omnipotent creativity by launching a "Rodin sculpture" of their own. This artefact - mocking Rodin's aversion against the moulage technique he was once accused to have employed for 'The Age of Bronze' - was subsequently canonised by a series of catalogues and exhibitions, till it was finally used as the basis for a posthumous edition by the Musée Rodin, supplied with a "A. Rodin" signature stamp. There are three different versions of 'The Hand of God', varying in the size. Athena Spear points out that the first version of 'the Hand of God' - 12 inches - was later enlarged to 28 inches and also reduced to 6 inches. 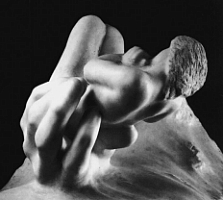 As a counterpart to the 'Hand of God' Rodin created the 'Hand of the Devil Holding Woman' around 1903. The title leaves room for the interpretation that Rodin, at times, perceived womanhood as a diabolic invention.